This anthology fills a gap which has been widely felt. 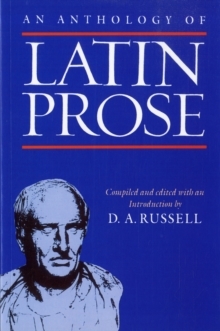 It gives students - at sixth-form, undergraduate or junior graduate level - the opportunity of sampling a very wide variety of Latin prose texts, chosen to illustrate both development and generic differences. Each of the 96 passages is accompanied by a short introduction, and there are brief notes explaining difficult words and drawing attention to linguistic and stylistic points occurring in the extracts. Theextracts range from the second century BC to the fifth century AD: Cato the Censor, C.
Gracchus, and the annalists; Cicero (oratory, letters, philosophical treatises); the historians (Sallust, Livy, and Tacitus); non-historical prose (Seneca, Vitruvius, Pliny, Apuleius, Tertullian); and finally someearly Patristic texts and extracts from the Vulgate.